Do you feel scrunched on one side of your trunk? Does it feel like one leg is shorter than the other? Your body is struggling with restrictions that are causing the soft tissue to shorten (i.e., compression). When this is occurring in the body some of the things that you may feel is one shoulder lower than the other, a sense that your waist is shortened, a hip or leg being pulled up towards your ribs, and possibly a feeling like you want to stretch or lengthen the side of your body. 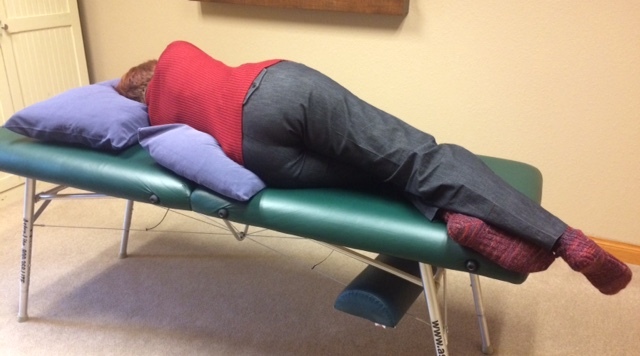 One of the myofascial self-treatment techniques that we recommend for our clients is a Sidelying Stretch. Learning how to correctly open up and lengthen the side of your body is beneficial for most individuals. It is very important that you have your therapist guide you on whether this technique is beneficial for you and take you through the correct way to utilize this technique. Click here for a step by step guide on how to create length and space along your side. * Move slowly through the steps and making sure to STOP when you feel a slight change or stretch. This is where your restriction is. Take a moment to breathe into the stretch and waiting until you feel the intensity of the stretch lighten, that is when the body released the restriction. Now you can again move slowly until you feel the next restriction and continue to repeat the same process. * NEVER force. You should only feel a light to medium stretch. * During any myofascial self-treatment technique you should feel the intensity increase when you find a restriction, then decrease when it releases, then increase when you find a restriction, and then decrease when it releases. The intensity should go up and down. If the intensity is more of a constant then you have pushed too far into the stretch and need to start over and lessen the intensity. When opening up the fascial system less is more. * It should ALWAYS feel GOOD. We all need length along our sides so give this wonderful myofascial stretch a try, but make sure to check in with your therapist to make sure that the correct technique is being used. Happy lengthening! I loved your reminder for self care techniques for clients, but do you have a you tube made so we can listen and practice as apposed to read.?? Let me know if you have that. Thank you for your comment. At this time we don’t have videos created, but hope to in the near future. Many of our clients love our MFRevive class as they walk away with many ideas for self care techniques. This class is an hour long and incorporates Myofascial stretch along with yin/restorative yoga poses. The instructor also provides hands-on Myofascial Release and technique cueing to assist the participants. Check our our events page for upcoming classes. Also, check back to our resource center frequently as we will be adding additional techniques and hopefully videos in the near future.